The market for tablets is getting more and more contested, especially in the high-quality section. The MeMO Pad HD 7 tries to sneak in below and appeal to cost-conscious buyers. Faster CPU, higher resolution, more storage, more RAM, more features,... We all know that these qualities come with a certain price tag. 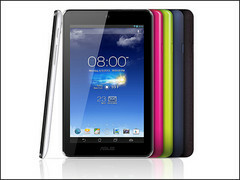 And while we all would like to have the ultimate tablet for free, quality simply has its price. 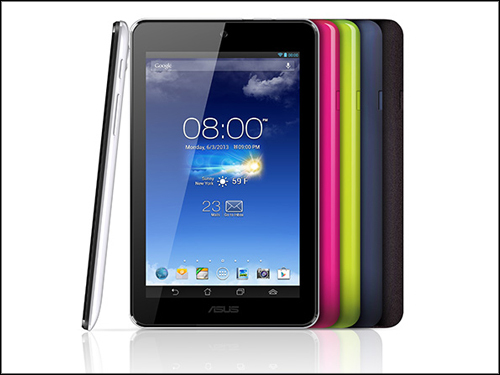 Asus now plans to come up with a decent tablet that doesn't want to compete with the high-priced devices. The MeMO Pad HD 7 is in no way a cheap tablet in regards to performance—it fares surprisingly well compared to popular devices like the Nexus 7 and actually deserves the title of successor to the old Nexus 7 by mirroring it in many aspects. For example, the MeMO Pad HD 7 features a 7-inch IPS display with a resolution of 1,280 x 800 pixels, measurements of 196.8 x 120.6 x 10.8 millimeters (compared to 198.5 x 120 x 10.45 millimeters) and 1 GB RAM - just like the Nexus 7 of 2012. And the 1.2 GHz MediaTek MT8125 processor also holds its ground versus the 1.3 GHz NVIDIA Tegra 3. Just like the new Nexus 7, the MeMO Pad HD 7 uses stereo-speakers as well as two cameras—one in the front with a resolution of 1.2 MP and one in the back with a resolution of 5 MP. The MeMO Pad even features something that the Nexus 7 still didn't get in its recent update: a microSD slot for up to 32 GB of additional external storage. Of course there are also a few trade-offs that come with a lower price: Gone is the high-end feel of the rubber back we are used to from the Nexus 7, the overall impression of the plastic used for the MeMO Pad is rather cheap. Also there is no NFC to connect you with the world, only 802.11b/g/n WLAN and Bluetooth 4.0. In return your wallet will thank you for only shelling out $129 for the 8 GB MeMO Pad HD 7 or $149 for the 16 GB model.